Moderate drinking is good for you, a BMJ-published study has found, directly contradicting the advice of the UK government's "Chief Medical Officer", who advised last year there was "no safe level" of drinking. A daily pint reduces risk of a heart attack and angina by a third, a big data study of Brit adults has found, while total abstinence increases the risk by 24 per cent. The proposition that alcohol has health benefits, and teetotalism invites greater health risks, has been established for a long time. A metastudy by Sheffield University noted that four out of five studies examined showed moderate drinking correlated with a reduction in mortality, with "moderate" defined as around three pints of beer a day for men, and two glasses of wine for women (as recently as the 1960s, official health advice suggested that a bottle of wine a day was fine). But the moderation message alarmed puritanical health campaigners and prohibitionists, who found a champion in civil servant Dame Sally Davies. Davies declared in January 2016 that there was "no safe level" of drinking based on highly contested "evidence". Campaigners argued that the samples of teetotallers in studies included former drinkers, who had already been "damaged" by years of drinking, and the conclusions were therefore unsound. 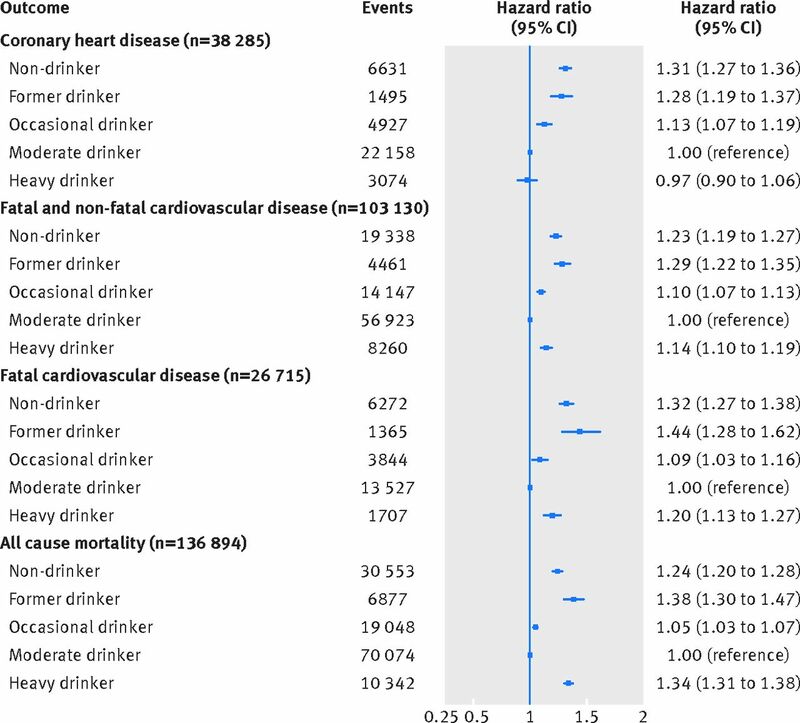 Non-drinking was associated with an increased risk of unstable angina (hazard ratio 1.33, 95% confidence interval 1.21 to 1.45), myocardial infarction (1.32, 1.24 to1.41), unheralded coronary death (1.56, 1.38 to 1.76), heart failure (1.24, 1.11 to 1.38), ischaemic stroke (1.12, 1.01 to 1.24), peripheral arterial disease (1.22, 1.13 to 1.32), and abdominal aortic aneurysm (1.32, 1.17 to 1.49) compared with moderate drinking (consumption within contemporaneous UK weekly/daily guidelines of 21/3 and 14/2 units for men and women, respectively). 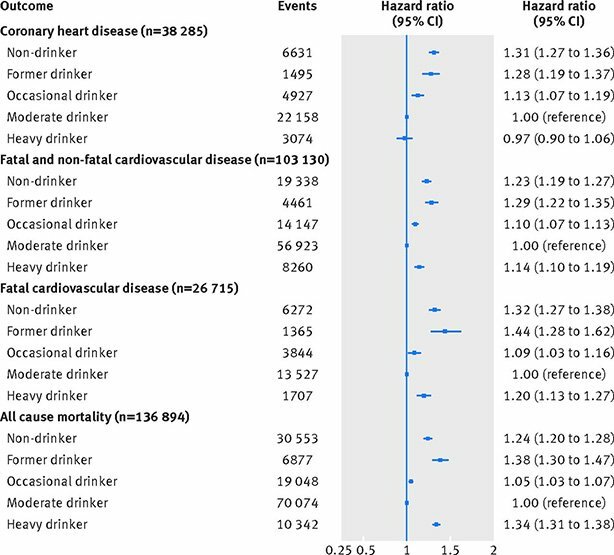 Heavy drinking (exceeding guidelines) conferred an increased risk of presenting with unheralded coronary death (1.21, 1.08 to 1.35), heart failure (1.22, 1.08 to 1.37), cardiac arrest (1.50, 1.26 to 1.77), transient ischaemic attack (1.11, 1.02 to 1.37), ischaemic stroke (1.33, 1.09 to 1.63), intracerebral haemorrhage (1.37, 1.16 to 1.62), and peripheral arterial disease (1.35; 1.23 to 1.48), but a lower risk of myocardial infarction (0.88, 0.79 to 1.00) or stable angina (0.93, 0.86 to 1.00). It should be noted that until recently journals rejected studies where the headline RR (relative risk or risk ratio) was under 3.0. However, more than 80 previous studies have come to the same conclusion of alcohol risk, showing a J-curve. The risk of total abstinence is higher than moderate consumption (20g a day, or two pints of beer a day for adult males) then increases as consumption increases. Perhaps wary of the reaction from the prohibitionists, the researchers stop short of recommending a change in the official guidelines, merely a more "nuanced" message.